Wolf: According to the dream books, dreaming of any animal signifies your “natural” feelings. Dreaming of an angry animal may mean that you are repressing your own anger. If you dream of a carefree animal you are probably wishing for more freedom and a chance to explore. Non-aggressive animals represent your feelings of trust and contentment and a playful animal in your dreams usually signify feelings of joy. As for actual wolves in your dream, well, they are usually a bad omen. If you dream of hunting one then danger is right around the corner. See yourself chased by one and it is a sign you are over-anxious about something. But if you kill one, then you may have one small success up ahead. But, since everyone interprets dreams differently and the meaning of a dream depends on the person and what‘s going on in their life, the definition above may not be true for everyone. 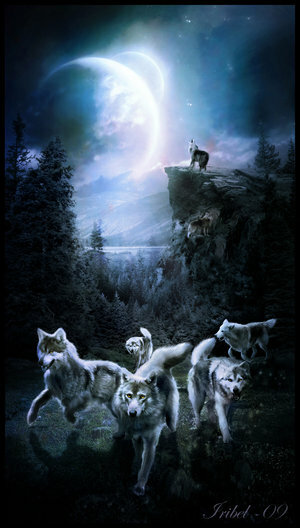 In another book, wolves represent beauty, power, a bit of mystery and your need for solitude. Moon: If you dream of the moon often it may mean that you will enjoy a burst of inspiration and creativity. A full moon usually signifies completion. Hunting: If you are hunting in your dream and succeed in the hunt then you will soon sort out your problems. But if you fail and your prey gets away it means that you will continue coping with your problems.